Rice Rice Baby | Committed. No choking hazard! My little one likes to experiment with things in her mouth (rocks, crayons, etc), and even though she did slip a few grains past me, I don’t need to rely on my rusty infant CPR skills. 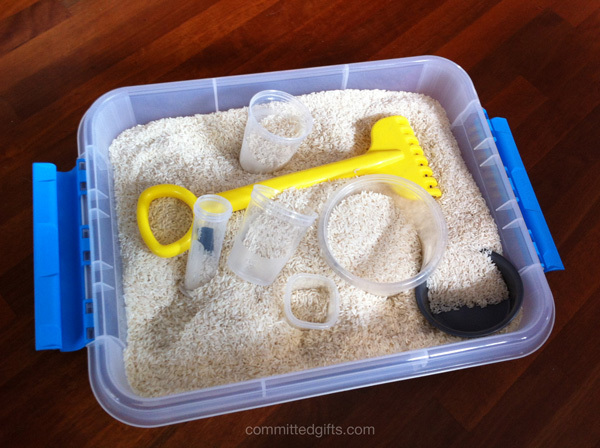 To reduce spillage and aid cleanup, sweep before playing (so you can just scoop rice back into the bin). Only fill the bin 1/2 full. 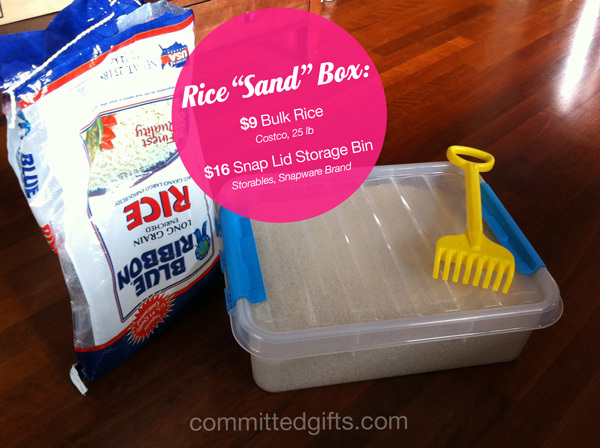 Keep extra rice for either cooking, or to replenish your “sand” box. 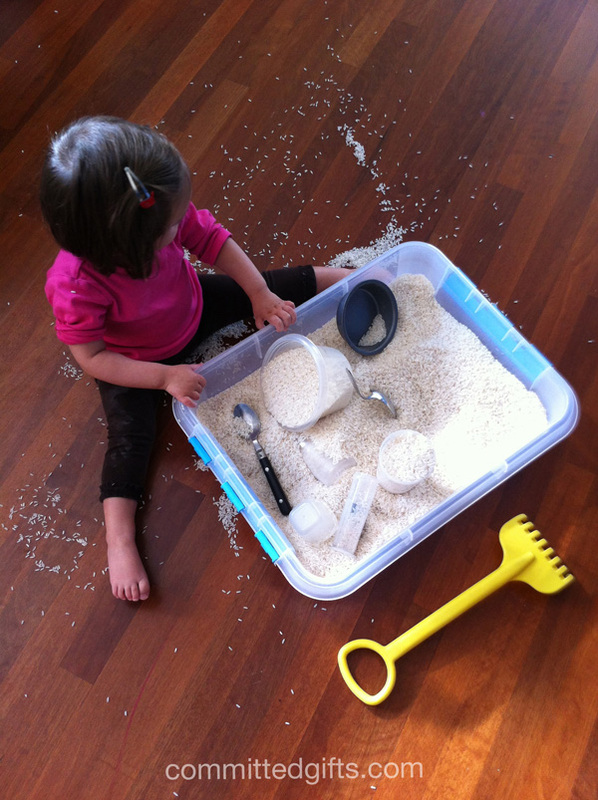 A great use of unneeded breastfeeding storage containers! I grabbed a bunch of old containers and spoons for scoopers. I knew I kept the Medela and Avent breastmilk containers for something! Basically anything can make a fun tool in here. Trucks and sandbox toys work great! 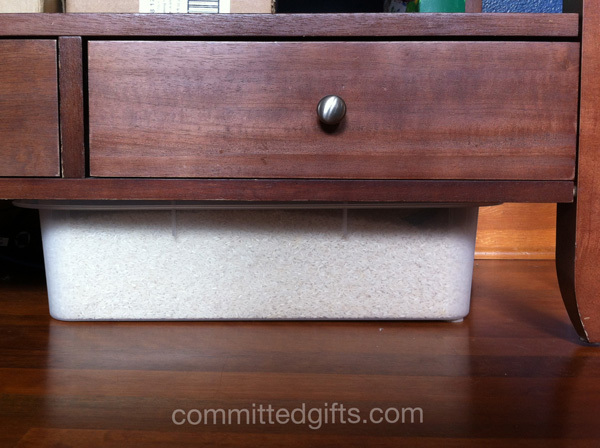 Protect your floors with felt furniture adhesive disks. Spills are inevitable, but easy to clean up. The more the merrier! A friend joins us for play time. 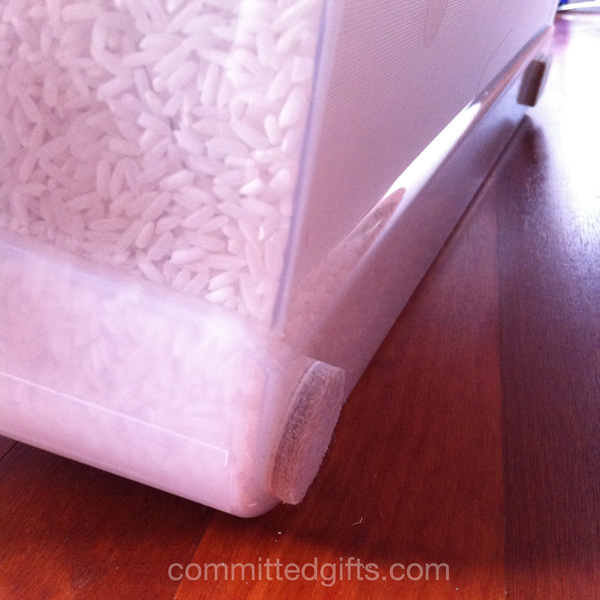 A low-profile bin allows for easy storage. Disclaimer: As with any toy, do not leave your child unsupervised. Large quantities of dry rice won’t be good for anyone’s tummy, and thrown grains can poke an eye. 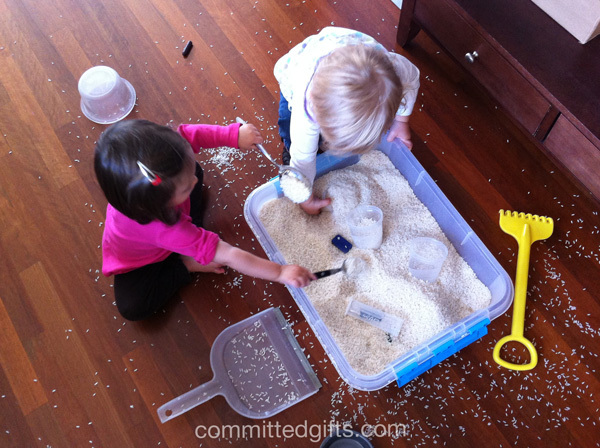 What innovative ways do you battle toddler cabin fever? « Fruit Stand. Sit. Stay. Great post and pictures, Jen! Thanks for sharing! I am delighted to see you implemented this for Little E and that she (and a friend!) had fun. I guess if summer had to officially end, that this is a great way to usher the kiddos indoors & keep their sandbox skills up to snuff for next year. Good work, mama! Just don’t put it near an unshakeable rug. Your vacuum will choke and bare feet will hurt or you could slip on the residuals & break parental bones. Just a thought from a neurotic mom….. In the spring you can use the rice to fill tube sox, sew them shut & you have heat packs for your aching muscles when heated in the microwave for about 2 minutes.